Yesterday I took day one of a watercolor workshop with Carol Carpenter, and I really enjoyed loosening up with her exercises and seeing her brushstrokes and how she approaches a painting. She gave us copious notes on all aspects of what she was showing us which was very nice. The top two are exercises in softening edges of circles, changing the shape, going back in and adding if you wanted…some became flowers. The second is called “three amigos”. 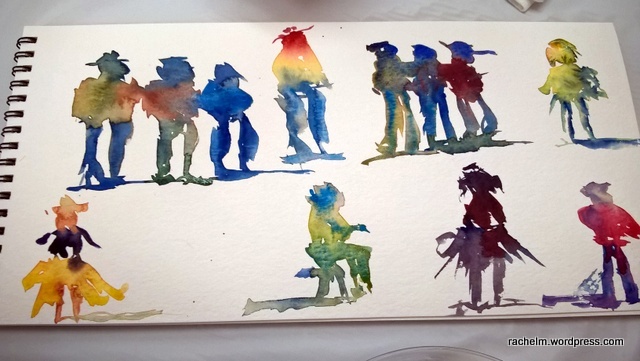 blobs of three colors which became torsos with the addition of heads and legs and their shadows…all done while holding the brush high up on the handle to loosen up. I used a dagger brush for these. way fun! 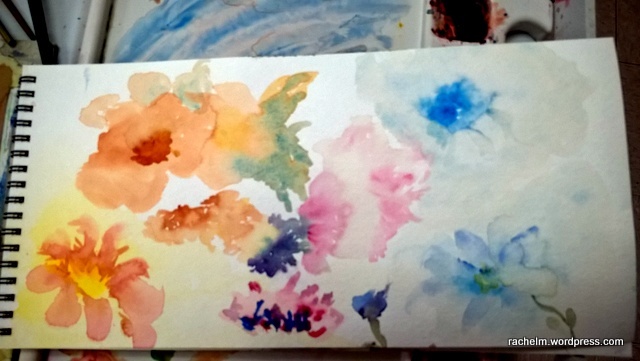 Another exercise was to make a painting of three flowers in 15 mins with using only 15 brush strokes….this keeps you thinking of how to get colors spread out and keeping the brush on the paper. she does this exercise to warm up several times a week, and I can see how helpful it would be to incorporate into my studio time. 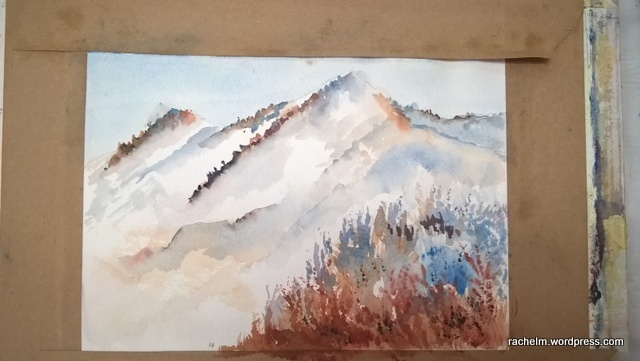 The bottom is an in process piece of snow on mountains in shadow. I’ll do more work on this today. 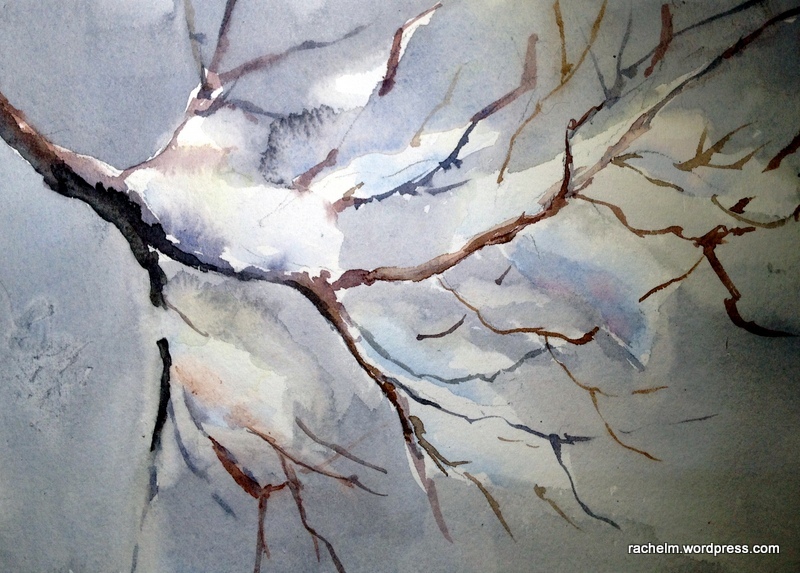 I’ve been painting but not posting, so here’s a catch up post of two more paintings of snowy branches and a wintery sky. I’ve been having fun getting to know my dagger striper brush, a Silver Black Velvet brush. I’ve been really happy with this brand of brush that combines the softness of squirrel hair with synthetic bristles. I have no affiliation with the company, but heard of it from friends, watched videos of them, and read reviews. It’s a versatile brush because you can press down as the larger part of the wedge is on the paper and then left off to aid the skinnier part of the wedge to make smaller branches. At this halfway point of the month, I thought I’d point out the slideshow of paintings from this month, as well as linking to the 30 paintings in 30 days page where you can see my progress from last year to this. As with golf, I feel sometimes like watercolor is two steps forward, one step back, but I like doing these challenges and documenting the paintings, because it lets me see the progress I’m making. Today’s plan is to start a larger piece following the mesquite shade study I did earlier this week. However there’s a big school project that I need to shepherd for my 8th grader, and we’re celebrating my mother in law’s birthday tonight…and there’s the playoff game this afternoon. So we’ll see…. I enjoy hearing from you and appreciate you stopping by! 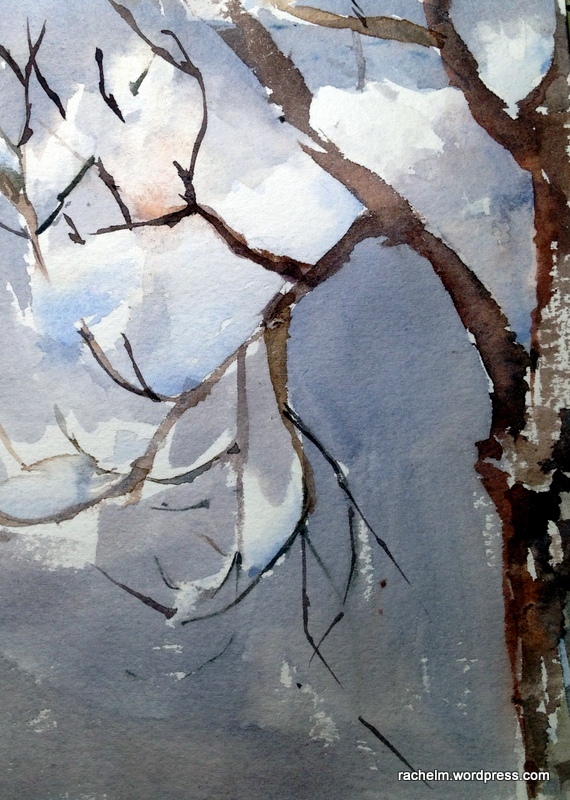 Yesterday and today I worked on small studies of snow on bare branches. Oddly enough I’m realizing now that I didn’t work from life (too busy when the snow was here) nor from photos (I don’t know why!) anyway, here are Day 2 and 3 of the 30 in 30 paintings challenge. The color of the stormy winter sky was made with cobalt and quinacridone burnt scarlet, sometimes with a little quin gold added. 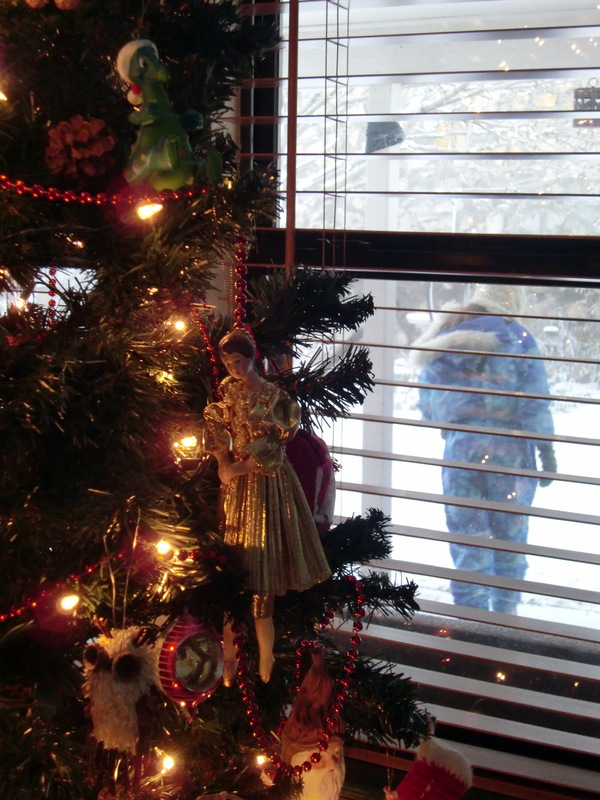 On these two, I put in the background after the branches and snow. On other studies I’ll show later, I used masking for the snow, painted the sky and then added the branches on top. The browns will certainly cover the blues. That’s the good thing about practice. You get to know which colors can be successfully painted on top of which other ones. The woods are lovely, dark, and deep…and beautiful in snow. Watercolor 6″ x 10″. Available. Click on image to view larger. Yesterday I attended my second class of the informal transparent group here in town and our teacher was Dorian Clouser. As before, I learned a lot, especially from watching her demonstrate the techniques. I also really appreciated that she visited with each student, offering praise and then helpful suggestions. She will be with us next week and I”m looking forward to it. This painting was wet in wet of a day with snow either in the air or coming soon, and we could take it in whatever direction we felt. Wet in wet is when you saturate the paper with clean water and once it has absorbed to a certain point you put on other paints in various stages of concentration. the more watery ones fade into the background and give texture and depth, the more concentrated (less water) don’t melt away as much and appear more prominent. it’s a balancing act of the amount of water and pigment, and it’s really quite fun! 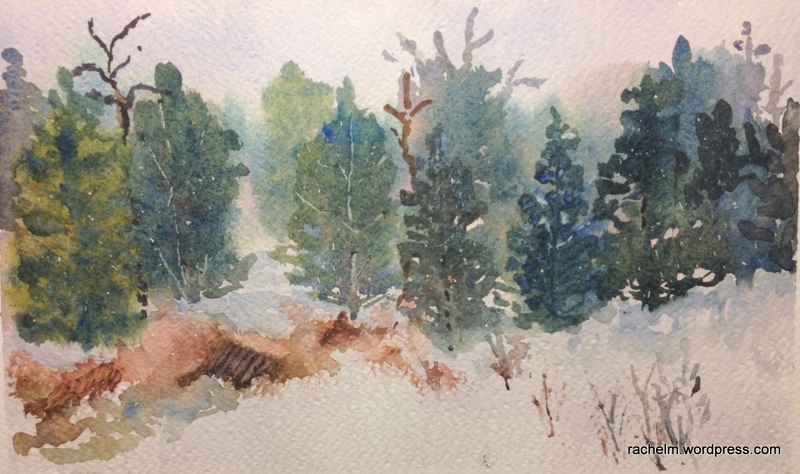 I also learned how to make the rough sticks and weeds coming out of the snow by loading a palette knife and making marks that way, so it’s not just brushes that you can use. In fact, we also learned how to make trees by using credit cards….more on that on another day, when I finish the painting! 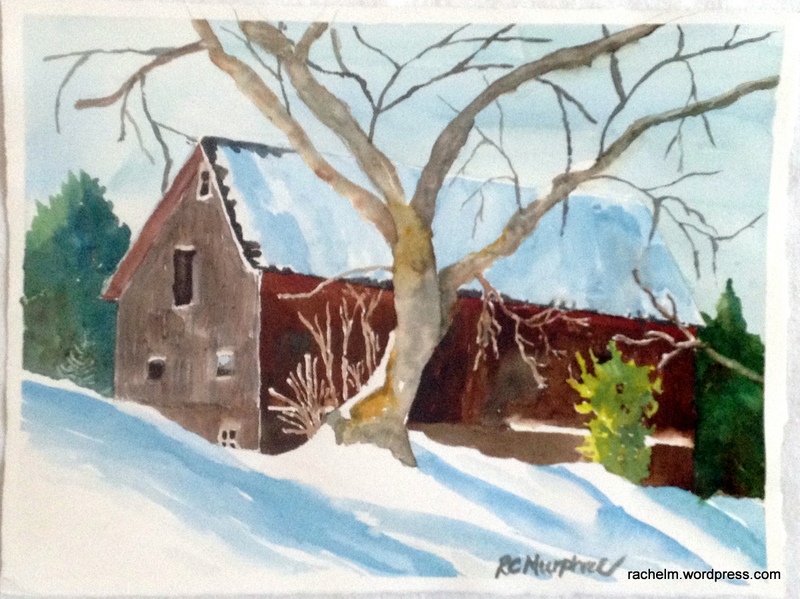 Last week I watched a video Watercolor Workshop by Sharon Lynn Williams. I really learned a lot from it on how to approach areas of color mixing, to keep the paints moist on the paper, to pay attention to edges and get them soft quickly if you need to in order to finish laying in the wash in that area without a drying edge. It gave me a lot more confidence to approach this challenge for November. and what’s this bottom image? Snow do you think? nope, not quite. Edible though…. curious? 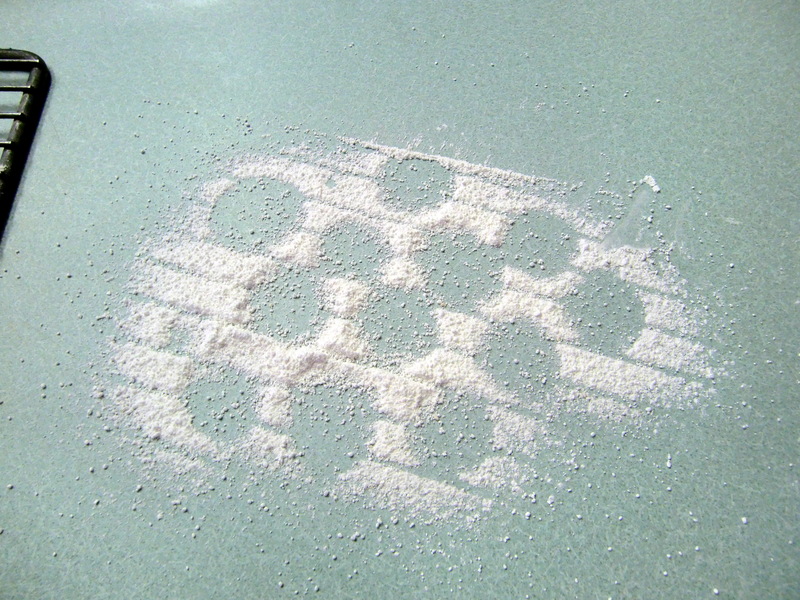 It’s the residue of powdered sugar sprinkled on cooling butter cookies when the cooling rack was lifted. Neat, huh?